I received this screen shot via an anonymous email several months ago. The email said: "This makes me think members of the Kansas NRA want to use their guns to shoot brown people." The screenshot features a photo of Kansas NRA president Patricia Stoneking "liking" a Facebook page called "American White History Month." That in itself is not a big deal. I am not a fan of Black History Month or Women's History Month or whatever. I personally believe all Americans share equally in the wonderful and unique heritage of this country. At first glance, the American White History Month page could just be a tongue-in-cheek humorous approach to saying Black History Month is unnecessary. And hey, I agree! "After thinking about what I wrote yesterday about how the races should stand together I know I was wrong, because the other races only stand for themselves. When the SHTF it will 93% of them voted for this potus, and the mexicans voted for him and the muzzrats did to. That makes it very clear to me that we can only trust 7% of blacks, 1% of mexicans and 0% of the muzzrats. 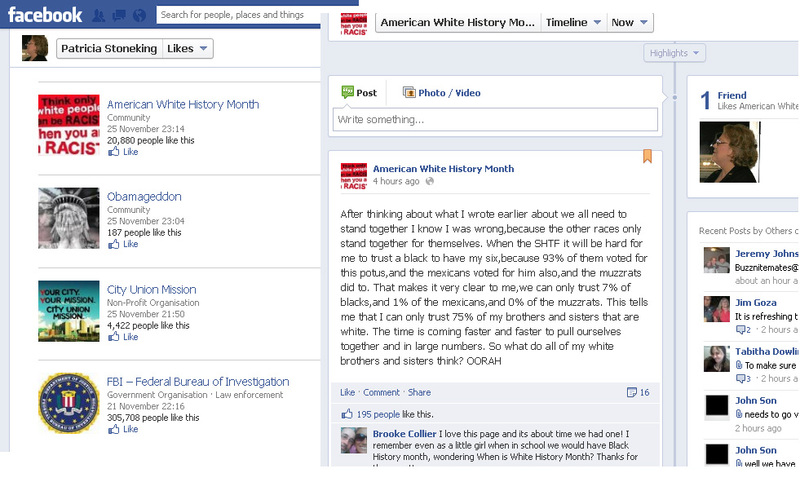 This tells me I can only trust 75% of my brothers and sisters that are white. The time is coming faster and faster to pull ourselves together and in large numbers. So what do all my white brothers and sisters think?" In Stoneking's defense, shortly after I received the anonymous tip about her inclusion in that vitriolic Facebook group, Stoneking "unliked" the page. And, if you visit the page today, it has been somewhat cleaned-up, and now reads almost like a support the troops kind of page. That's not how the page looked when Stoneking was a member. It was post after post of words like "muzzrat." It was disgusting. I don't have enough words to describe the knot I had in my stomach reading it -- even regurgitating a tiny bit of it makes bile rise in my throat. Two, I get sick and tired of the Republican Party being branded as racist. It's simply not true. Are there bad apples? Of course. The Democrats have (probably more) bad apples too. They're just not called out as often. I have met Stoneking a number of times, and she strikes me as, well, a character. I prefer to give people the benefit of the doubt. Maybe she simply skipped over that racist vitriol in her Facebook feed?? I don't know, and I've never asked. But shortly after I received an anonymous email, she was no longer a member of the group and I let it go. Participating in a forum of "Kansas Frontiersmen" describing themselves as "a network of survival-based defense units" that "mixes survivalists, prepping, and the defense aspects of the militia into a completely new approach" Patricia Stoneking, President of the Kansas-NRA, posted the personal home address of Manhattan School Board Member Aaron Estabrook. In a screed against "Moderate" political leadership Kansas Frontiersman group founder, James R. Miller Jr posted a comment that read: "I am at the point of now when some raises there [sic] fists to me in a threatening manner, I am going to respond by punching them in the throat and kicking there [sic] balls in until they can taste them", Stoneking responded by providing the home address of Aaron Estabrook, his wife Kim, and their two daughters. I'm a big believer in the GOP self-policing, and well, now may be the time for Stoneking's friends and supporters to quietly encourage her to move on down the road. It appears she may be a bad apple, and well, the Kansas GOP has an awfully big barrel. And I think it's worth saving. I think you're spot-on on this. And Gidget: I love you. Really, I do.